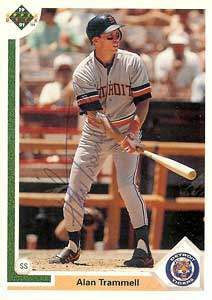 Alan Trammell was born on Friday, February 21, 1958, in Garden Grove, California. Trammell was 19 years old when he broke into the big leagues on September 9, 1977, with the Detroit Tigers. His biographical data, year-by-year hitting stats, fielding stats, pitching stats (where applicable), career totals, uniform numbers, salary data and miscellaneous items-of-interest are presented by Baseball Almanac on this comprehensive Alan Trammell baseball stats page. Did you know that Alan Trammell and Lou Whitaker played together from 1977 until 1995, and hold the American League record for longest continuous double-play combination in Major League history, playing 19 seasons together across 1,918 games and turning more double plays than any other shorstop-second baseman combination ever? Trammell won four Gold Gloves , Whitaker three, and the duo twice won Gold Gloves during same exact season (1983 & 1984). Alan Trammell played his entire Major League career with the Detroit Tigers, twenty consecutive seasons spanning three different decades. Only two players in franchise history have had longer stays in The Motor City - Ty Cobb (1905-1926 in Detroit, 22 Years) and Al Kaline (1953-1974 in Detroit, 22 Years). When Alan Trammell made his debut in 1977, he was the youngest player (19) on any American League team. Three years later he was named to his first All-Star Game (five more would follow), won his first Gold Glove (three more would follow), and the year he won his final Golden Glove , he won a World Series ring (and the World Series MVP Award ). The golden gloves stopped, as did the rings, but three Silver Slugger Bats found their way onto the mantle and a few records (see Fast Fact #1 & #2). Five years after Trammell retired, baseball historian / expert Bill James rated Trammell the ninth best shortstop of all time in " The New Bill James Historical Baseball Abstract " and higher than fourteen Hall of Fame shortstops. However, Trammell was passed over by the Baseball Writers Association: 15.7% (2002), 14.1% (2003), 13.8% (2004), 16.9% (2005), 17.7% (2006), 13.4% (2007), 18.2% (2008), 17.4% (2009), 22.4% (2010), 24.3% (2011), 36.8% (2012), 33.6% (2013), 20.8% (2014), 25.1% (2015) and 40.9% (2016) - a wrong, righted by the Veteran's Committee in 2018.